In 1941, RG Menzies delivered to war-time Australia what was to be his richest, most creative speech, and one of his most influential. 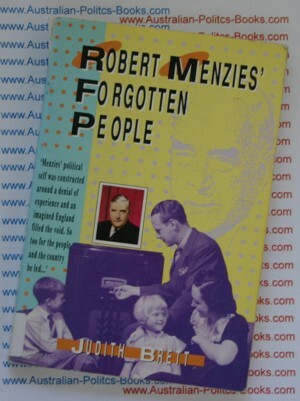 The Forgotten People was a direct address to the Australian middle class, the "people" who would return him to power in 1949 and keep him there until his retirement in 1966.
Who were these forgotten people? The middle-class pitting their values of hard work and independence against the collectivist ethos of labour? Women, shunning the class-based politics of men? The parents of Menzies' childhood in the small country town of Jeparit? And how did this relate to his fervently-held belief in his status as a Briton, the boundaries of which nation were "not on the Kentish Coast but at Cape York and Invercargill"? Judith Brett deftly traces the links between the private and public meanings of Menzies' political career. Taking us deep into both the man and the culture he represented and well beyond the restraints of a conventional biography, Brett, reveals the ambivalence that lay at the heart of the Australian self-image.